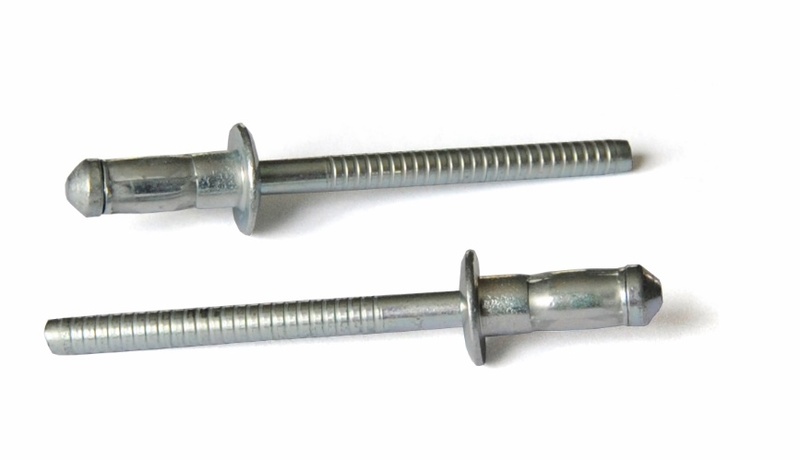 Tight and high resistance fastener, designed for use in single-sided applications. Its large bearing area on the blind side makes this Hard Grip Rivet ideal for applications with hard plastics and thin sheets. Bralo Hard Grip Rivet is designed for the most demanding applications that require a great clamping force and high tensile and shear strengths. Due to its feature of a wide expansion on the blind side, both the torquing and the load forces are well distributed. It is therefore particularly suitable for the work with hard plastics and thin sheets of metal. Its unique grooved mandrel design allows the head of the rivet to be completely held inside the body due to a mechanical locking, avoiding thus any kind of electrical problems and noises. It allows a homogeneous riveting, a solid and high quality joint that resists all kinds of vibrations. Head locking system through a mechanical locking of the grooves. Large bearing area on the blind side; especially suitable for applications with thin sheets. Good hole fill, which allows to compensate for uneven, misaligned, oversized or grooved drills. Both the load and the torque force are distributed due to the wide expansion on the blind side. Firm, high quality joint that is resistant to vibration. Good performance in applications requiring high temperatures. Materials: Steel and Stainless Steel.